For a long time, I had no great desire to go to Bali. It seemed like the place to see drunken Aussie bogans on full display in a foreign country. Not a pretty sight. I have had a number of people change my mind on this, though. The end result of these conversations is that we are going to be spending a couple of weeks there. We leave tomorrow. There are a bunch of reasons for doing this. We have been waiting (impatiently at times) for the kids to be old enough to get something out of an overseas trip. Also we were looking for somewhere relatively cheap without being poverty stricken, and exotic without being overwhelming. Really, we just wanted somewhere easy and interesting. In a similar way to how going camping was something of a trial run for greater things, our first international adventure doubles as a potential lead in for something bigger down the track. Things have been pretty relaxed around here lately with our homeschool. Learning never stopped over the summer break. It just slowed down. We are comfortably ahead of schedule. It seemed both unnecessary and counterproductive to fully get into schoolwork for a couple of weeks, only to then stop and go on holidays. Of course, most of the focussed lessons we have been doing lately, have in some way been related to Indonesia. The bulk of Indonesia is made up of a large volcanic chain. There has been quite a lot of discussion over plate tectonics and how volcanoes work. There are active volcanoes in Bali so depending on how things go, we will get to have a good look at one. Those particular lessons were something of a double edged sword. I also had to spend quite a bit of time reassuring the boys that the volcanoes were not going to erupt underneath us while we were there. Bali lies just on the other side of the Wallace line, which should be interesting. This is the line which divides Asia and Australasia from an ecological perspective. Outside of domesticated species, all the plants and animals will be foreign to us. We spent a lot of time looking at maps and talking about barriers of movement. Birds and fish, for instance, might be easily able to cross a sea barrier which is impassable to plants and animals. We also, of course, spent some time reading and discussing the difference in culture. My oldest boy, especially, is very much into the idea of living in a hut. I think he will enjoy seeing a village which more or less lives up to his expectations. There are lots of terraced hills and rice paddies where we are going. The idea of a stepped landscape was an interesting one for us. We liked the photos. Of course it was later reimagined. We have had to get plane tickets, passports and vaccinations. This trip has been a point to count down to for quite a while. There is a lot of excitement over going, but for all the preparation, I don’t think the boys really understand what they are in for. Despite that, I am sure they will handle it well. I think we are all going to have a lot of fun. 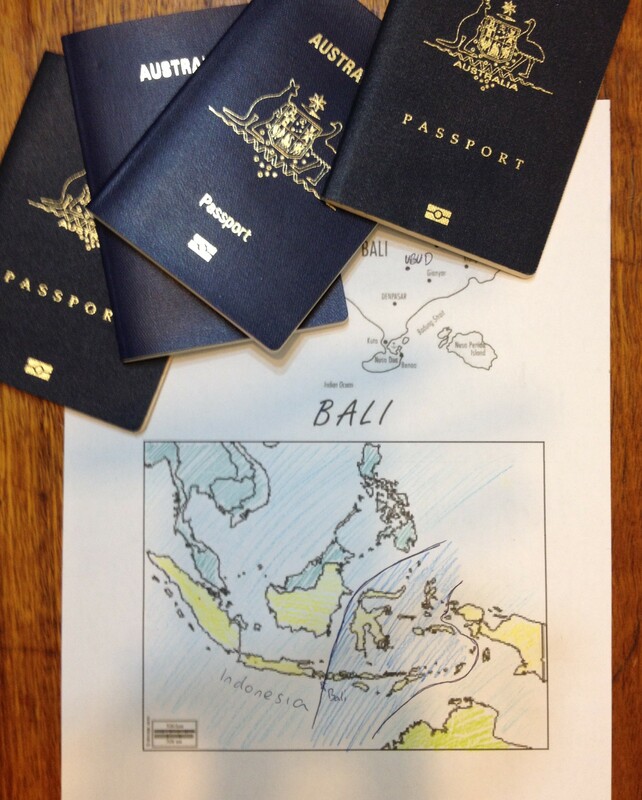 This entry was posted in Geography, Life experiences and tagged bali, bloke, homeschool, life experience, travel. Bookmark the permalink. Bali is one of the most amazing places I have visited. There is a tremendous amount of poverty in Bali though. You will drive through places, depending on activities you do, that will make you really appreciate the things you have. I hope you have a great trip, we sure did!